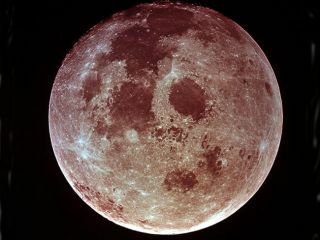 With this dome as a reference, we expect something on the horizon (such as the moon) to be farther, and because it is actually no farther than when overhead, our brains goof and imagine that it is larger. Skeptical? You can test this from home. When the moon first rises, hold something small like the eraser of a pencil at arms length and compare its size to the moon on the horizon. Do the same a couple hours later when the moon is higher. Or try this: Take a picture of the moon in both positions, then cut, paste and compare. Another trick: Make a tube from rolled-up paper so the opening is just slightly larger than the moon when it rises. Tape the tube so the size stays fixed, then check later to see if the moon has changed sizes. Officially, the moon will be full Saturday June 30 at 9:49 a.m. ET. Of course, you'll want to do your looking in the evening. Local moonrise times are available from the U.S. Naval Observatory. Keep in mind that mountains and buildings can dramatically alter your actual local moonrise time. The big-moon-rising effect will be evident Friday, Saturday and Sunday. On each evening, the moon will appear nearly full. Interestingly, the moon is never fully full from our point of view, but that's another story. While you're out, check out Venus and Saturn, which are snuggling close together in the western sky as darkness falls. So why is one full moon lower in the sky than another? The moon's orbit around Earth is tilted 5 degrees compared to the plane of Earth's travels around the Sun, and Earth itself is tilted on its rotational axis. All this accounts for the lunar phases, and it also means the moon's path through our sky can be higher or lower depending on the angles on any given night. The complex orbit of the Earth-moon system is constantly evolving, too. Right now, the moon is moving away from us by more than 1.5 inches every year.